1.1 What is a Complex Site? 1.5 What is Adaptive Site Management? The Koppers Oroville site is a former wood treating facility that operated from 1948 until it closed in 2001. The site occupies approximately 205 acres in Butte County, California, near the City of Oroville (Figure 7). The site is bounded by the former Louisiana-Pacific Lumber Mill to the west, Georgia Pacific Way to the north, and Bagget-Marysville Road to the south and east. Land use surrounding the site is a mixture of residential, industrial, and agricultural uses. As of 2015, approximately 10,650 people lived within a three-mile radius of the site and rely on groundwater as their source of drinking water. Figure 7. Site features, former Koppers Oroville Wood Treatment Facility (USEPA 2013a). 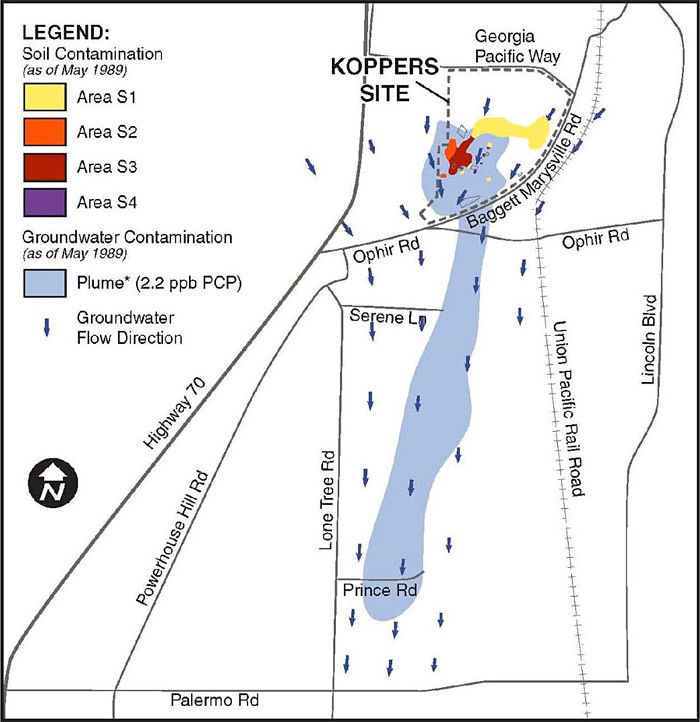 During the early 1900s, the area around the Koppers site was used for gold mining dredge operations. From approximately 1920 to approximately 1948, the site was operated by Hutchison Lumber Mill. In 1948, National Wood Treating Company purchased the site and began operating a wood treatment plant. In 1955, Koppers Company purchased the site and continued wood treating operations. In 1988, Beazer East, Inc (Beazer) purchased Koppers Company. Beazer later resold the wood treating operation back to Koppers Industries, Inc, which continued to operate the plant until 2001. Beazer retained responsibility for all cleanup actions. The main areas of operation at the site (Figure 7) included a wood processing area (main process area) and creosote settling ponds. From 1961 until 1973, blowdown from a Cellon wood treatment process was released into about an acre near the western site boundary (Cellon blowdown area). In 1963, a pole washing unit was installed in the northern portion of the plant site. From 1963 through 1973, equipment was used to spray a solution of water and sodium hydroxide on the Cellon-treated poles to both remove excess pentachlorophenol (PCP) from the pole surface and to prevent formation of PCP crystals on the wood surface. Wastewater from the process was not contained, and much of this wastewater flowed to a small depression just south of the pole washer. Because of wood treating operations, the site became contaminated with wood-treatment chemicals, including PCP, creosote, and polynuclear aromatic hydrocarbons (PAHs), as well as heavy metals including copper, chromium, and arsenic. Wood treatment solutions dripped onto the ground as the treated woods were removed from process areas and otherwise handled. Wastewater from wood-treating processes were collected in unlined ponds. Boron, which was used as a fire suppressant, is also present. Two fires (1963 and 1987) resulted in releases of PCP and dioxins/furans to site soils. PCP is present as DNAPL at the site. The geological formations underlying the site include alluvial gravels, sands, and clays that were deposited by the Feather River and its ancestral river systems. Several interconnected aquifer zones have been defined in the area. The first encountered groundwater at the site occurs in the gravels of the Laguna formation and in the Mehreten formation in some areas. Groundwater in the Ione formation is brackish and saline and is separated from overlying freshwater aquifers by low permeability clays. Perched groundwater exists in areas scattered throughout the site. The complexities at the site include creosote DNAPL in the vadose zone, groundwater contamination off site and on site, off-site contamination of private drinking water wells, and extensive soil contamination requiring on-site landfilling. Although off-site groundwater contamination has been significantly abated, DNAPL remains on site. Long term groundwater monitoring and long-term maintenance of the on-site landfills are required. In 1988, an RI report summarized the results from soil sampling investigations in 1981, 1986 (Phase 1), and 1987 (Phase 1B). Soil samples were analyzed for a variety of chemical constituents. The major contaminants found in on-site soils include PCP, creosote compounds, and metals used in the chromated copper arsenate treatment process. Other chemical species detected included isopropyl ether, boron, PCP breakdown products, and dioxins/furans. Contaminated areas included the PCP mix area, the PCP treated wood quality control area, the pole washer area, the chromated copper arsenate treated wood storage areas, and areas along all tram tracks used to transport PCP-treated poles. Other areas investigated in a subsequent Phase IB investigation in 1987 included former disposal or accidental wastewater spill areas, an ash pile located southwest of the Eastern Spray Field, oily soils found in and near the drainage ditch along the property boundary, background soil conditions, and soil conditions at locations where new construction had been proposed. Although not part of the RI program, soil samples were also collected adjacent to the process area (actively used at the time the RI was performed) following the 1987 fire. Chemical preservatives including PCP, creosote, and chromated copper arsenate were dripped onto site soils as the treated wood was handled. Additionally, wastewaters from creosote and PCP wood treating processes were discharged directly to unlined ponds near the western boundary of the plant. Contaminated soil became airborne due to traffic and wind erosion. Surface water runoff passing over contaminated soils resulted in contaminated surface waters and sediments. Contaminants in soil leached into groundwater beneath the site. The following COCs were present in groundwater above their respective ROD cleanup levels: PCP, isopropyl ether, dioxins/furans, PAH, boron, and benzene. Contaminated groundwater migrated beyond the site boundary in a plume that extends approximately two miles south of the site. Two distinct PCP plumes on the property are attributed to activities at the former pole washer area and process area (eastern plume) and to PCP cosolved in creosote DNAPL under the former creosote pond area and former Cellon blowdown area (western plume). The remedy for the site was described in the original 1989 ROD, 1991 ESD, and ROD Amendments 1 and 2 (1996 and 1999). Four soil operable units, OU S1 through OU S4 were designated (Figure 8), as well as two groundwater units: on-property and off-property. Cleanup standards for soil were based on direct contact with surface soil and were set to residential standards. The ESD provided separate cleanup standards for subsurface soil to protect underlying groundwater. Cleanup goals for groundwater were established as MCLs for PCP, total carcinogenic PAHs, dioxins/furans, and background levels for arsenic and chromium. The facility conducted bench-scale and pilot treatability studies of bioremediation, soil washing, and soil fixation from 1992 through 1994 to evaluate the soil remedies selected in the ROD. Treatability study results indicated that the technologies could not achieve residential cleanup standards, nor could they effectively treat the combination of COCs in surface soils. Dioxin and furan concentrations were detected in surface soils above the industrial standard for workers in 1993. USEPA authorized the removal of soils with concentrations of dioxins/furans greater than 1 µg/kg. The facility excavated and placed over 15,000 cubic yards of dioxins/furans impacted soil and debris in an on-site soil disposal cell. ROD Amendment 1 changed the remedy as follows: (1) modified soil cleanup standards to be industrial cleanup standards; (2) called for excavation of contaminated surface and subsurface soils and placement of these soils in a new on-site landfill; and (3) required a deed restriction to prohibit future residential use of the site. The site soils were landfilled because treatability studies demonstrated that the previously selected remedies for site soils could not achieve cleanup goals. ROD Amendment 2 modified the groundwater remedy by providing for (1) a TI waiver for on-site groundwater due to creosote DNAPL contamination; (2) adding enhanced in situ bioremediation to the remedy to augment PCP destruction; and (3) adding MNA as a contingency remedy should enhanced in situ bioremediation nutrient distribution not be fully achieved in the aquifers. MNA was included as a contingency remedy because site data showed that PCP degraded naturally both on and off the property. MNA will be implemented as a contingency remedy if the USEPA determines that (1) enhanced in situ bioremediation nutrient distribution cannot be adequately achieved; (2) other active restoration measures are not necessary; (3) site conditions continue to demonstrate that PCP degradation is occurring; and (4) natural attenuation is expected to achieve cleanup levels within a reasonable time frame achievable by a treatment remedy. Remedial actions were implemented for soils and for groundwater plumes both on and off the property. The remedies described in the ROD, ESD, and ROD Amendments 1 and 2 have now been implemented, including soil removal in the former process area (Area 8C). Two on-site soil disposal cells were created. Soil Disposal Cell No. 1 accepted 15,000 cubic yards of soil from the bioremediation test plot with high dioxin/furan levels and was completed and closed in 1995. Soil Disposal Cell No. 2 was constructed adjacent to Soil Disposal Cell No. 1, near the northern boundary of the Site in August 1996 (see Figure 8) and received excavated soil from the top 14 feet of former creosote pond (11,216 cubic yards), the top 20 feet of the pole washer area (4,830 cubic yards), the top 10 feet of the former Cellon blowdown area (11,130 cubic yards), and approximately 40,000 cubic yards from the process area. Soil remediation was completed and the Soil Disposal Cell No. 2 was closed in September 2002. Groundwater treatment systems for on-property and off-property plumes began operating in 1993 and 1994. As mentioned in the discussion of the site CSM, two distinct on-property plumes are present, eastern and western. The on-property plumes have become hydraulically separated from the off-property plume because of the on-property P&T system operation. The groundwater P&T system for the eastern plume includes two extraction wells (EW-1 and EW-2) and two injection wells (IW-3 and IW-4) for reinjecting the treated water. Extracted groundwater is treated by an air stripper, a multimedia filter, and granular activated carbon to remove PCP, isopropyl ether, and PAHs. Currently, PCP is the only COC detected in the influent at concentrations exceeding the ROD standards. In August 2002, groundwater extraction began from monitoring well MW-8, which is near the center of the eastern PCP plume to address boron contamination in groundwater. In situ bioremediation was conducted to remediate PCP in 1998. Oxygen-releasing compounds (ORCs), including magnesium peroxide and diammonium phosphate (DAP), were periodically added to six on-property wells to supply nitrogen and phosphorous and enhance bioremediation. The western plume is located below the former Cellon blowdown area and former creosote pond area. In September 1994, a passive recovery well (PR-1) was installed in the western plume to evaluate whether the subsurface pools of creosote at the site could be effectively remediated by draining the fluid into a recovery well. The well has two separate screened intervals. Each 10-foot screen is located immediately above a clay lens, where free creosote is perched. The mobile creosote enters the well through the screened intervals and collects in a 5-foot deep sump at the bottom of the well. Fluid is purged periodically from the well and taken to an off-site location for disposal. From 1994 to July 2007, approximately 1,300 gallons of DNAPL were recovered. In 1999, about four acres surrounding the former creosote pond and Cellon blowdown areas were declared a TI zone in the ROD Amendment No. 2. This TI zone occurred because both the existing P&T system and in situ PAH bioremediation failed to remedy the DNAPLs present in the clay layers beneath this area. Currently, monitoring for carcinogenic PAHs (cPAHs) continues downgradient of the TI zone to ensure that the ROD standard for total cPAHs is not exceeded. 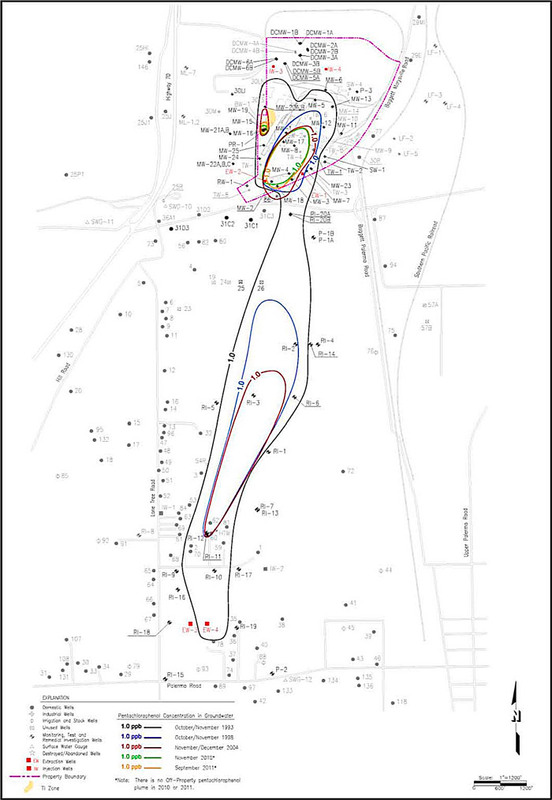 Beginning in March 1986, an alternate water supply was provided to 34 residences downgradient of the site, within the off-property plume area. The alternate water supply for those affected by the groundwater contamination was formalized in the ROD. A total of 26 residents were taken off the alternate water supply in 1998 after their wells met the cleanup criteria, as well as another residence in 2001. 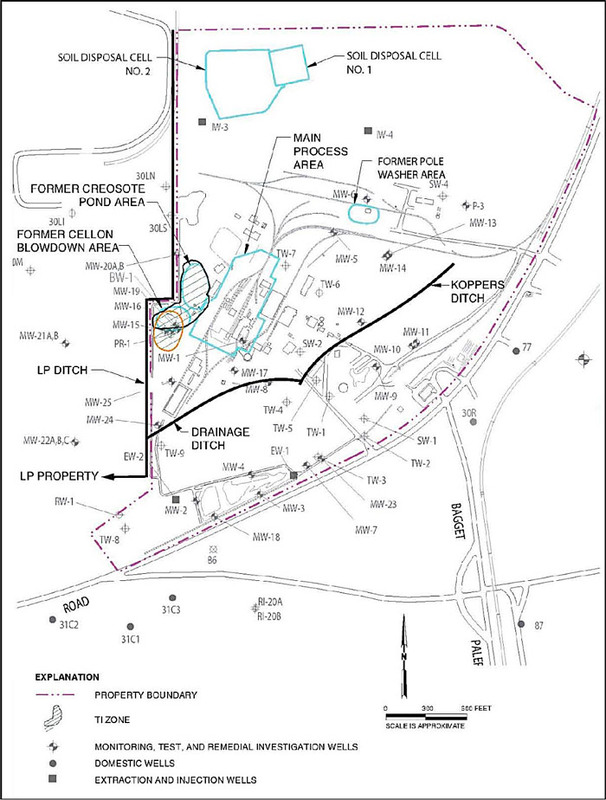 An off-property groundwater treatment system was installed south of Prince Road (Figure 9). Two extraction wells (EW-3 and EW-4) were installed at the toe of the two-mile plume (Figure 9) along with a treatment plant, two injection wells, and approximately 1,500 feet of pipelines. Initially, treated water was discharged to Wyman Ravine. Later, this water was reinjected upgradient of the off-property plume into injection wells IW-1 and IW-2. The P&T system was shut down in December 1995 and dismantled in 2007, after monitoring indicated that the plume had retreated upgradient of the extraction wells. During its operation, the system treated over 626 million gallons of contaminated groundwater. An in situ bioremediation program was implemented in August 1998 to augment degradation of PCP in off-property groundwater. Magnesium peroxide and diammonium phosphate were periodically added to wells 26, RI-11, and RI-20A and performance evaluation data collected from monitoring wells RI-2, RI-3, RI-10, RI-12, and RI-16B (see Figure 9) and two private wells (59 and 81). The in situ bioremediation program continued until September 2009, when PCP was no longer detected in any of these wells for four consecutive quarters. The site achieved construction completion on September 4, 2003. The preliminary close-out report documented that all remedial construction activities for the site had been completed in accordance with closeout procedures for NPL sites. Groundwater is monitored using a dynamic groundwater monitoring optimization program. Monitoring is based on recent analytical results from individual wells. If a parameter is detected above its respective ROD standard, it is analyzed during the next quarterly event. If the detection is verified, the sampling frequency for that parameter is increased. If a constituent is not detected in a specific well above the ROD standard for four consecutive sampling rounds, its sampling frequency is decreased. The minimum sample frequency is once every two years. Remedy O&M is administered by the state of California. Currently, monitoring for carcinogenic PAHs (cPAHs) continues downgradient of the TI zone to ensure that the ROD standard of 0.007 ppb for total cPAHs is not exceeded. The FS was conducted in 1989, and for purposes of evaluating alternatives, site soils were divided into four operable units. Remedial options for soils that were evaluated in the FS included capping, biological treatment (in situ biodegradation), physical treatment (soil washing), thermal treatment (off-site incineration), chemical treatment, and disposal by landfilling. During remedial design, it was determined that the dioxin/furan contamination was more widespread than originally estimated, making the alternatives listed in the ROD infeasible. ROD Amendment 1 therefore changed the remedy for soils to on-site landfilling. The selected remedial alternatives for soil are summarized in Table 15. Soil remedies in ROD were modified to on-site landfill in Cell No. 2 for contaminated soils from all four units (S1 through S4), as well as other contaminated soil areas not addressed in the ROD. Total area of soil to be cleaned up was 25 acres, with estimated soil volume at 100,000 cubic yards. Cleanup goals were changed to industrial use standards. ICs were implemented via a land use covenant (deed restriction). Treatment technologies for groundwater were evaluated for the two operable units for groundwater, on-property and off-property, including physical and chemical pretreatment, bioremediation and biofiltration and carbon adsorption. Two methods for treated water discharge were evaluated: surface water discharge and recharge wells. Recharge wells had less impact on the environment than discharge to surface water, and could influence groundwater flow to enhance extraction. ROD Amendment No. 2 added in situ bioremediation to the groundwater treatment remedy and declared a TI zone for areas contaminated with PAHs and creosote DNAPL. The selected remedial alternatives for groundwater are summarized in Table 16. On-property groundwater Installation of extraction wells and treatment plant to treat contaminated water by carbon adsorption. Pretreatment required for water containing contaminants not treatable with carbon. Treated water disposed to surface water or reinjected into groundwater via injection wells. Augment the P&T remediation by enhanced in situ bioremediation to on-property eastern plume treatment by adding nutrients (oxygen, nitrogen, phosphorus) to on-site wells with downgradient monitoring. TI waiver for the groundwater cleanup at the former creosote pond and Cellon blowdown areas due to the presence of DNAPL (on-property western plume). Allow monitored natural attenuation (MNA) as a contingency remedy (on- and off-property plumes). Revised groundwater standards for PCP from 2.2 to 1.0 ppb and for barium from 680 ppb to 1,000 ppb. Off-property groundwater Installation of extraction wells, with contaminated water treated by carbon adsorption. Provide an alternate water supply to those residents with contaminated wells until remedial standards are met. Augment the P&T remediation by enhanced in situ bioremediation (on-property eastern plume). Allow MNA as a contingency remedy. Modify alternate water supply termination criteria to provide conditions under which the use of the alternate water supply can cease. USEPA encouraged public participation throughout the RI/FS process and remedial design/remedial action of the project. Fact sheets were sent to the public at key progress points in the investigation and site cleanup. Informational meetings and site tours were held during remedial design/remedial action process and representatives of public agencies and local citizen groups invited to attend. Remedial design/remedial action documents were also sent to local libraries.